Perchlorate, which can form different salts, is a key reason why liquid water sometimes flows on the planet despite the atmospheric pressure. And it can be used as a major ingredient in rocket fuel. It can even be broken down and used as a source for electricity and oxygen for human explorers. The chemical was identified by NASA’s Phoenix lander in 2009 and since then, scientists found that it abounds on the Red Planet — it’s 10,000 times more abundant in Martian dirt than it is in Earth’s sands and soils, Phys.org reports. 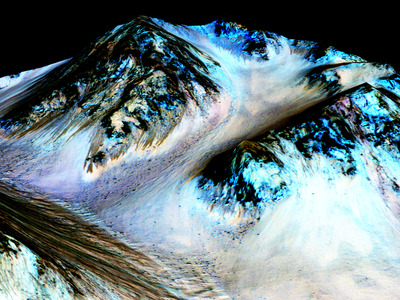 The discovery helped scientists figure out how liquid water could exist on Mars, affecting the planet’s surface. Because of the thin Martian atmosphere, pure water can only exist as ice or vapour on the planet. But dissolved salts can change this chemistry, occasionally allowing liquid water to manifest as lakes or streams, Discover reports. “Perchlorate could hold the key to understanding underground water, and in turn microorganisms that lend insight into space biology. In addition, it could help determine the right landing sites and positions of human colonies, and ‘changing’ Mars’ design to resemble Earth,” Discover writes. “This means that we’ll have to take extreme precaution to remove perchlorate from Mars water and dirt, or from any crops that we grow in it,” Discover writes.